Birthstone jewelry is a thoughtful birthday gift idea for anyone. deBebians carries a wide variety of gemstone jewelry and our Gemstone Jewelry Guide outlines all of the different options that we currently offer. 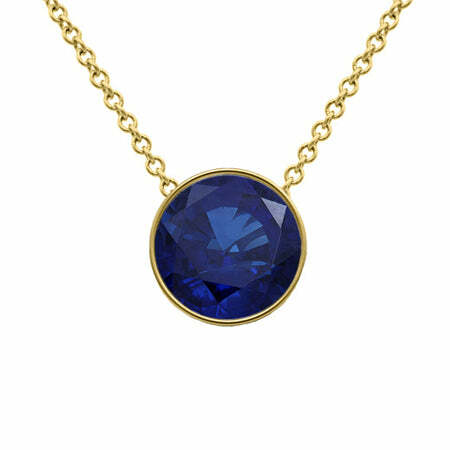 For your loved ones that were born in September, a necklace that features blue sapphires is a stunning way to show off the September birthstone. The necklaces that I have selected are affordable, classically beautiful, and created with the love and care for which deBebians is known. Style # SBY-5014 currently starts at $551.00 for 14kt gold and a 16″ chain. 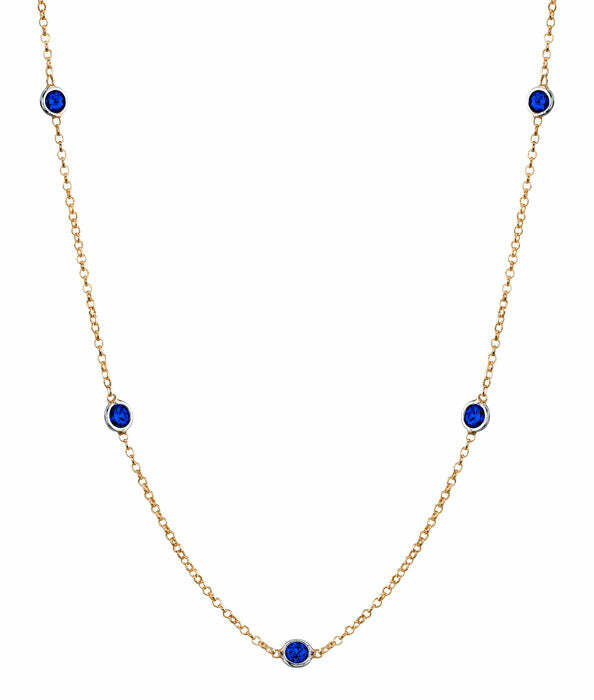 The vibrant color of the blue sapphires comes through beautifully on our gemstone station necklace. The delicate bezel settings are created by hand to ensure that they are delicate, yet strong enough to hold each and every gem. 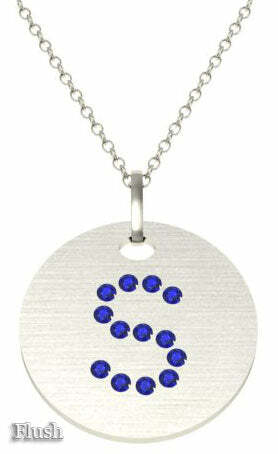 Style # SSP-01 currently starts at $463.00 for a 0.33ct sapphire on a 14kt gold chain that is 16″. If your loved one prefers the look of a single gem, a solitaire sapphire necklace is a gorgeous option. We offer a four prong setting or a bezel setting, but both will look timeless on the matching chain. Style # BSFP-19 currently starts at $526.00 for a 14kt gold pendant on a 16″ chain. Gold disk pendant necklaces with a lone initial are trendy yet refined. Choose the wearer’s first or last initial in addition to the metal type and the setting style to create the desired look. To view our entire collection of birthstone jewelry, please browse our Gemstone Jewelry Guide. We also love creating custom jewelry, including necklaces, so please do not hesitate to contact us if you would like to inquire about creating a unique piece.